National Literacy and Numeracy Week kicks off today and what better way to celebrate than to have some fun with the kids at home. Miss 8 loves reading and all things literacy so I’ll be playing some maths games with her as she’s asked for some help with her times tables. We’ve been coming up with strategies to learn them easily and the Nifty-Nines has been a winner. Haven’t tried it yet? Don’t worry you can check it out here. Master 6 is in Kindergarten so we will be coming up with some games to get those sight words happening. He loves learning by doing so he couldn’t get enough of this activity, needless to say I’ve invested in a fly swat for when the sticky hand is too dirty. 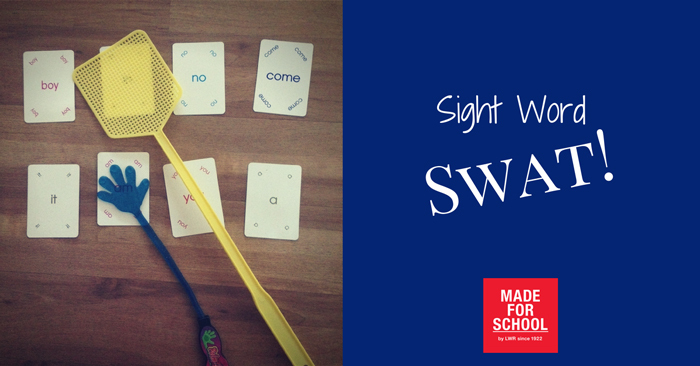 If you’ve got someone who loves to learn by doing then give this activity a go with spelling words or sight words, you’ll all enjoy it. Sight words or spelling words on card or paper but laminate them so you can reuse them. Place 5 cards around in a circle, spacing about 30cm apart. Have the child stand in the middle. Point to a word and have the child read it, once they’ve got it right let them swat it and move onto the next word. Once they’ve done with the first lot, keep going as you’ll be amazed at how many words you can get through. For spelling words you can have them swat it and give it to you then spell it or you can hold the card, have them spell it then put it down for the swat. How do you make literacy and numeracy learning fun at home, I’d love to hear your ideas.